The timing of our trip to the United Kingdom meant that we had to stay over the weekend. We started the trip in Scotland and then went to Manchester on Thursday. Friday, Saturday and Sunday were all on our own My coworkers made their plans and I made mine. My plan involved - don't be shocked here - birding. I know from past experience that it can be difficult to go birding alone in a new place. Luckily, I have friends who are very experienced with international travel. Marc recommended that I check out a website called birdingpal.com. The site matches travelers with local birders who are willing to take them birding. I signed up and sent messages to a few birders on the list. Someone responded but said that he would be out of town during my stay. He said that his friend Rachel would be happy to help. Thankfully, she was. 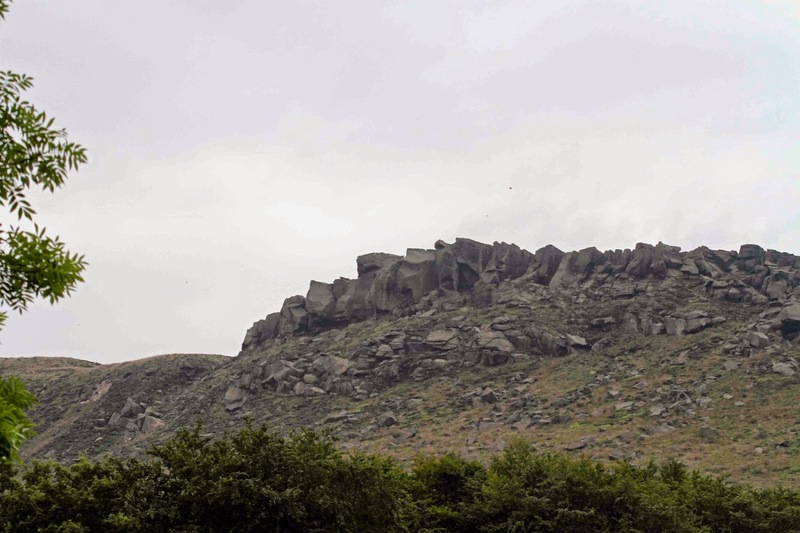 We agreed to meet up on Friday and explore "the moors". It was terrific - the birds and the moors and the "pal". The hike yielded some excellent birds. It is amazing how many sat up on the boulders and posed for us. This is Mistle Thrush which is huge compared to our Wood Thrush. 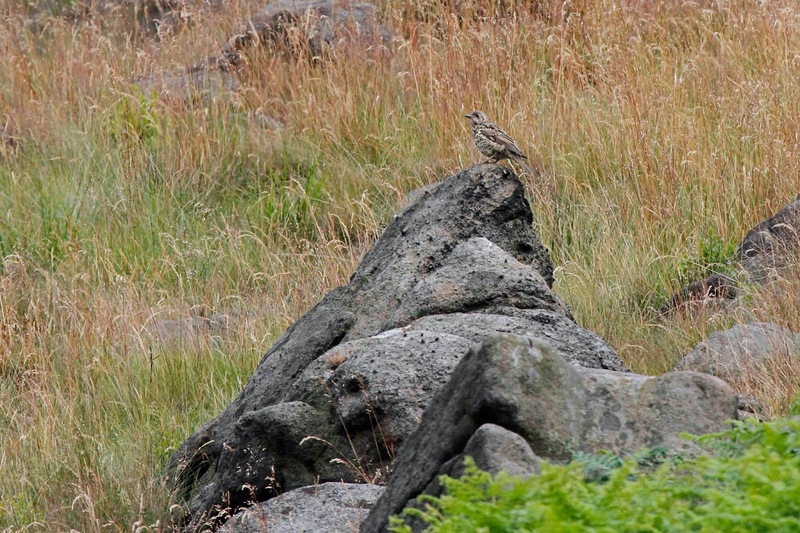 I am always thrilled to see a grouse. 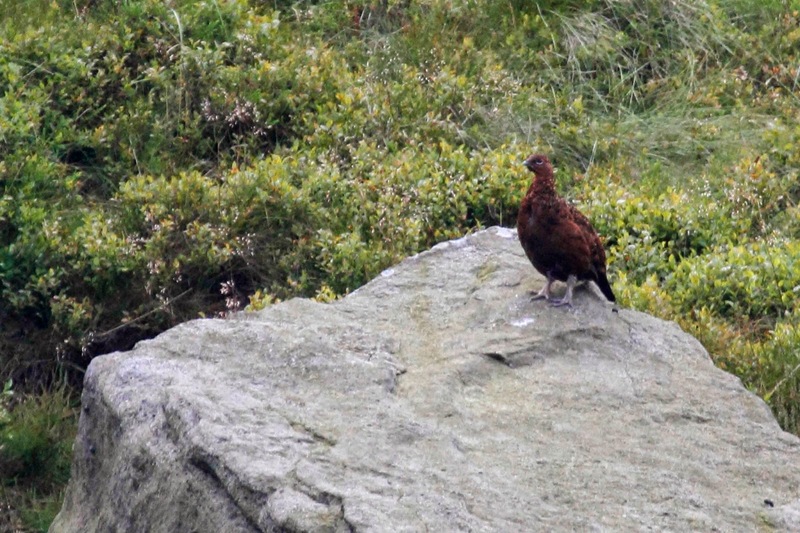 This is Red Grouse which is actually a Red Phase of the Willow Ptarmigan. This photo should give you some perspective of the size of the boulders. 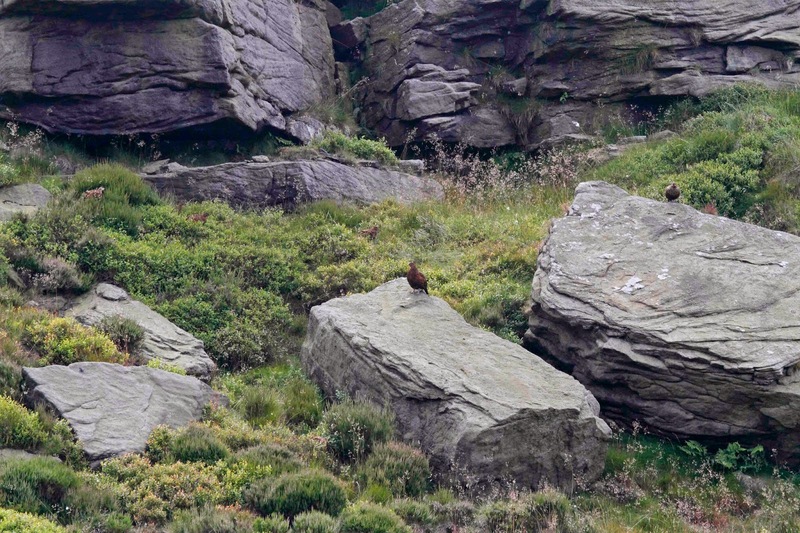 Can you find the whole family of Grouse? There are at least 6 of them. 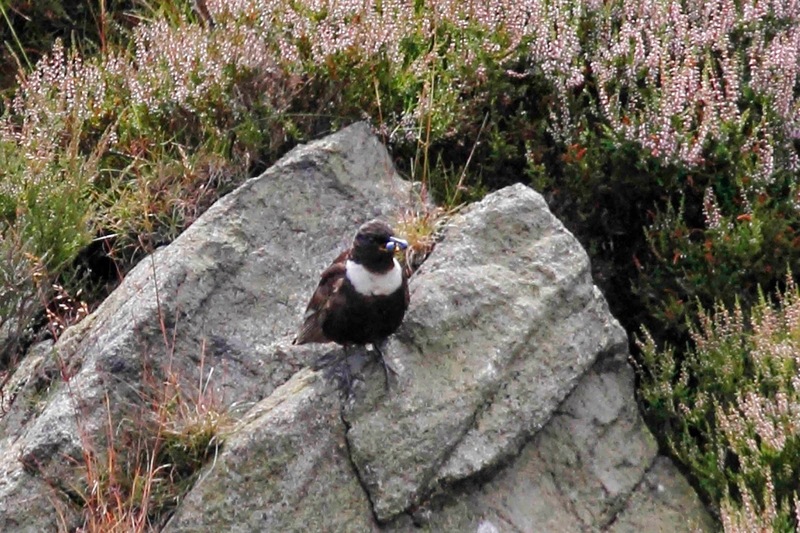 One of my target birds for the trip was Ring Ouzel - just based on the name. "Ouzel" My birding pal Rachel knew that there was one in the area and quickly pointed it out. Here he is bringing food back to the nest. In England, the grazing and property rights are different from the US. Sheep seem to be everywhere, and people are allowed to hike through pastures. 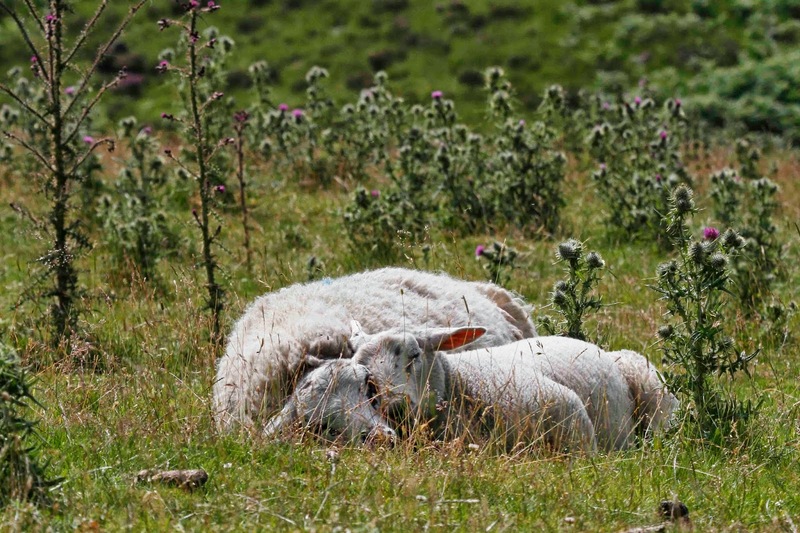 Here are a few sleepy sheep on the moors. Here is a photo of Rachel on the moors. You can see how vast the space is in this part of England. There is also a gruesome story that goes along with the photo that I won't share here. Suffice to say that it is just one more benefit of finding a local to go birding with.